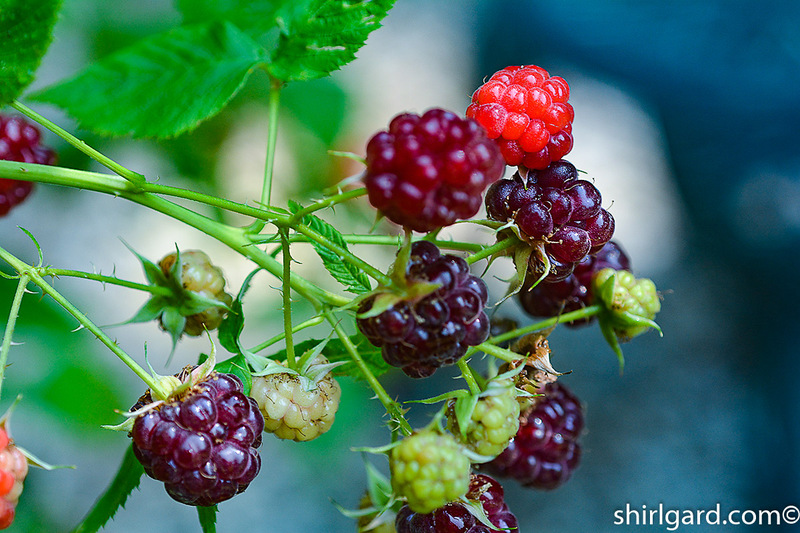 Shirl Gard, Author of this Blog: Pastry Chef - Food Photographer - Writer. This is Where I Share my best Recipes and Baking Experiences, With Dollops and Pinches of Nostalgia Thrown in. The Recipes are Carefully Crafted & Include Many Step-by-Step Photos to Insure your Baking Success. 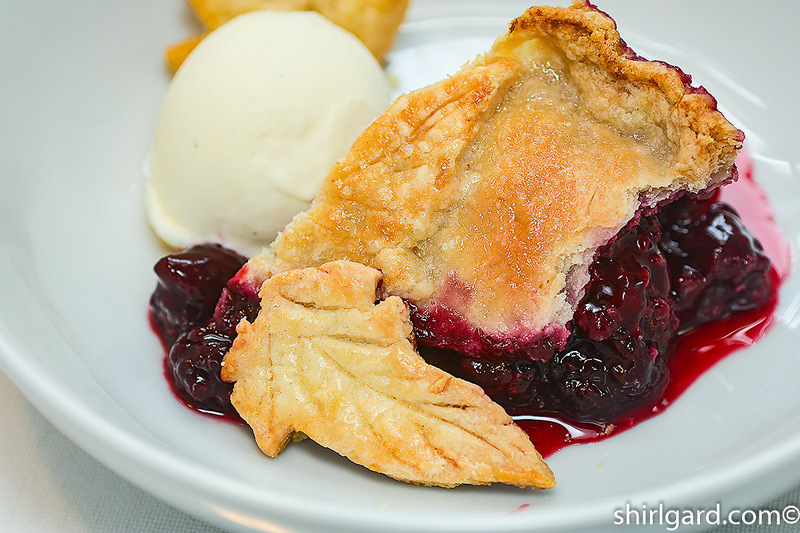 This is how I became inspired to create this Blackberry Cobbler. 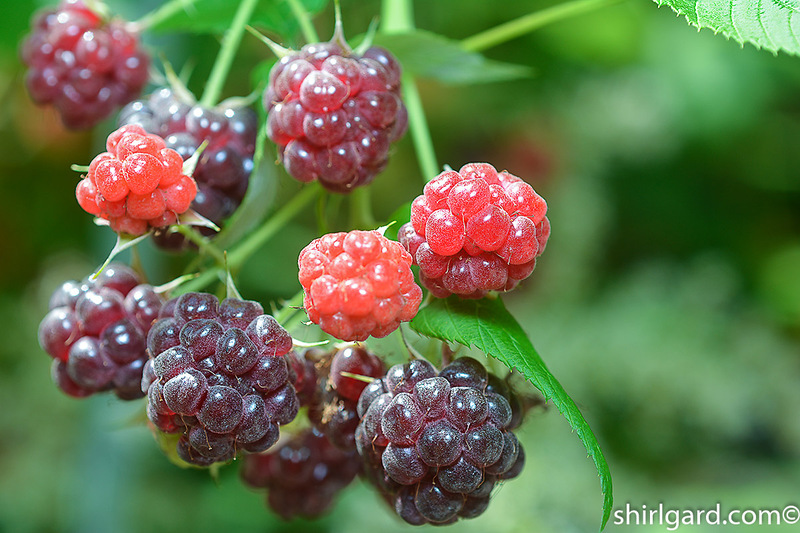 A few years ago, when I lived in Lenox, Massachusetts, a small blackberry bush with a few scraggly berries, just appeared in my garden one summer. It must have been wild since I didn’t plant it. Nevertheless, there it was, right at the front of the garden calling to me. After the snow had cleared the next spring, when I went down to check out the garden, the blackberry bush had grown to mammoth proportions and brambles covered the path. After a serious pruning, it still was at least ten feet wide, and required quite a bit of staking. 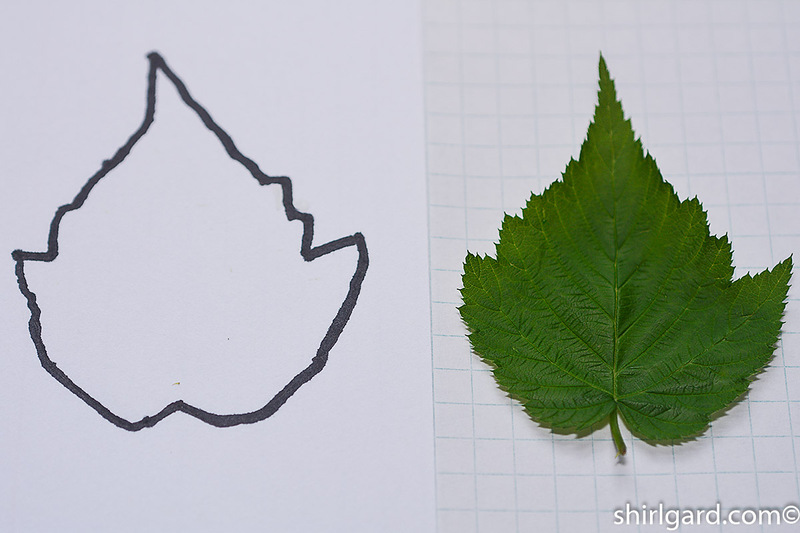 Although it remains a complete mystery as to how it got there, and how it grew to become so enormous and majestic, I came to think of it as a sign, a symbol, trying to get my attention and remind me of many long-ago memories. 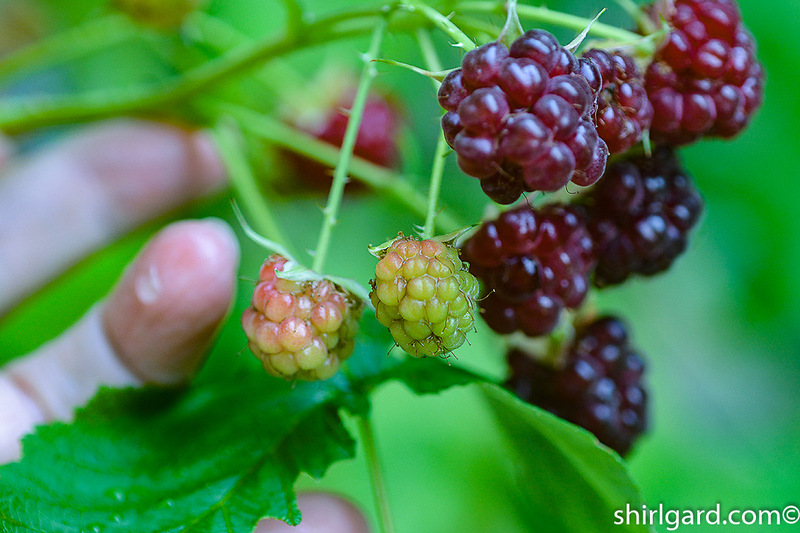 It was the sight of those sprawling thorny canes laying in the path that triggered one flashback in particular: a hot summer day, when I was growing up in Oklahoma, and my mother took us kids berry picking. 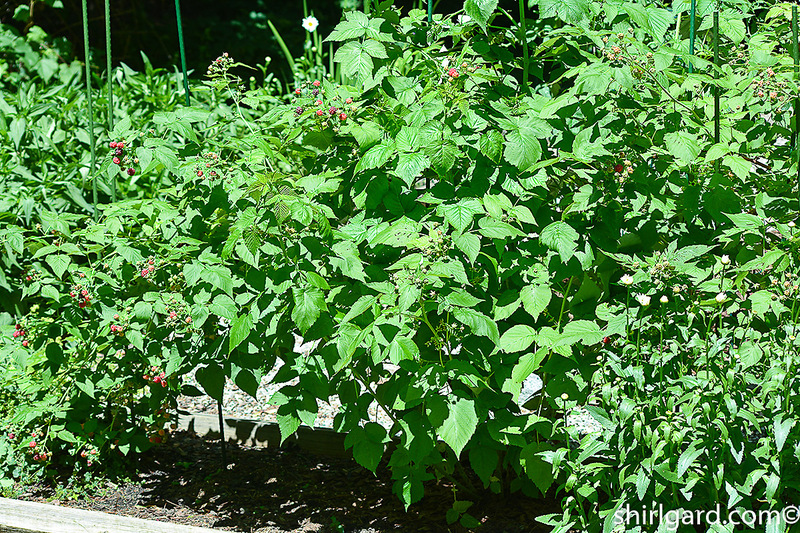 Wild blackberry bush in my garden, Lenox, Massachusetts. Summer 2014. 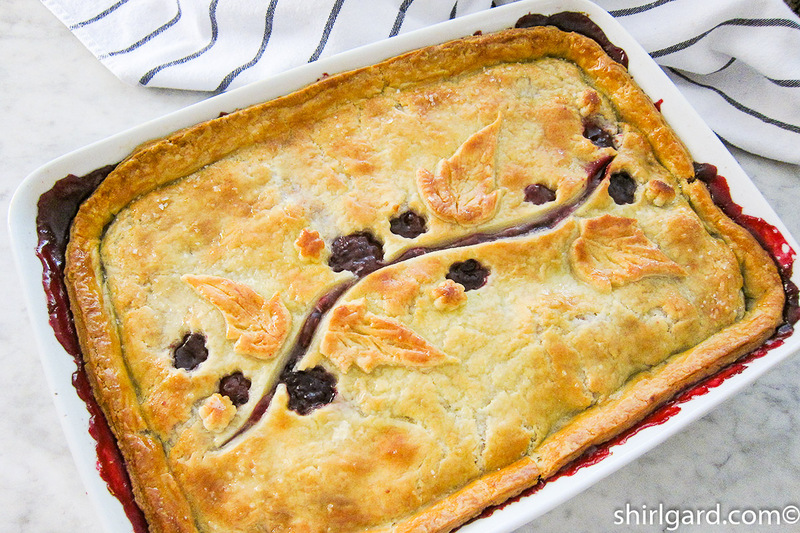 The wild blackberry bush that became my symbol for remembering, and inspired this flashback and Blackberry Cobbler. 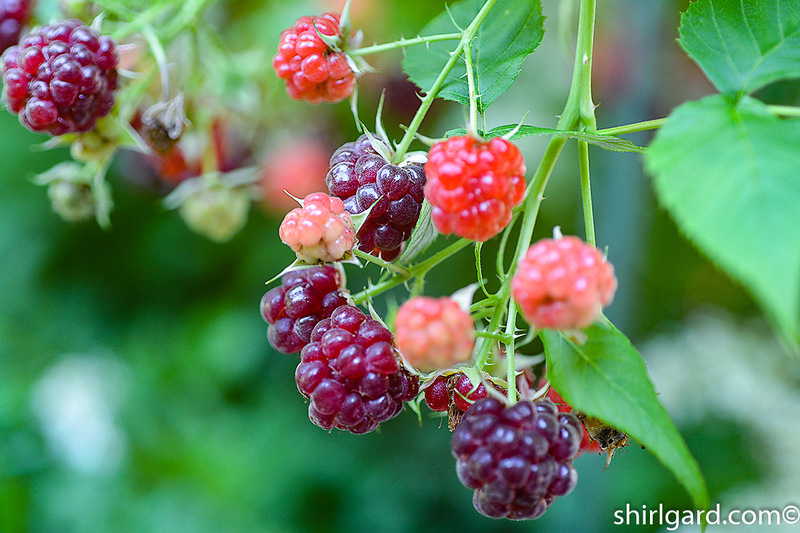 The berries aren’t as large as those from the supermarket, but they taste great. The brambles are thick behind the dilapidated old barn, the paint long ago worn away by the weather, on the farm that my father leases for his herd of cattle. 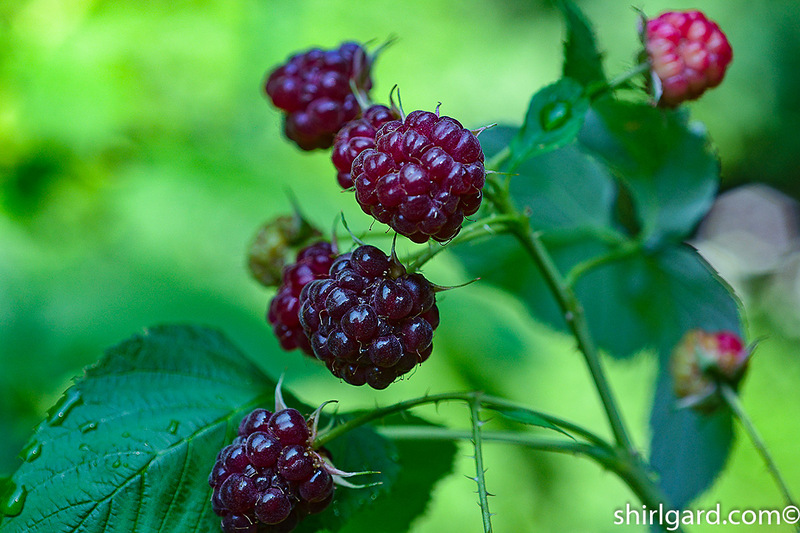 They are covered in luscious plump blackberries as well as thorns, in seemingly equal amounts. They surround a rusty old tractor and other assorted pieces of abandoned farm equipment. There are four of us and we each have our own bucket: mother, my brother, Danny, my little sister, Kay, and me. Mother wants us to pick enough to make a cobbler and then have some left over. We spread out and begin, making our way through the thorny canes, trying not to get scratched. Danny climbs up on the tractor and picks from there. 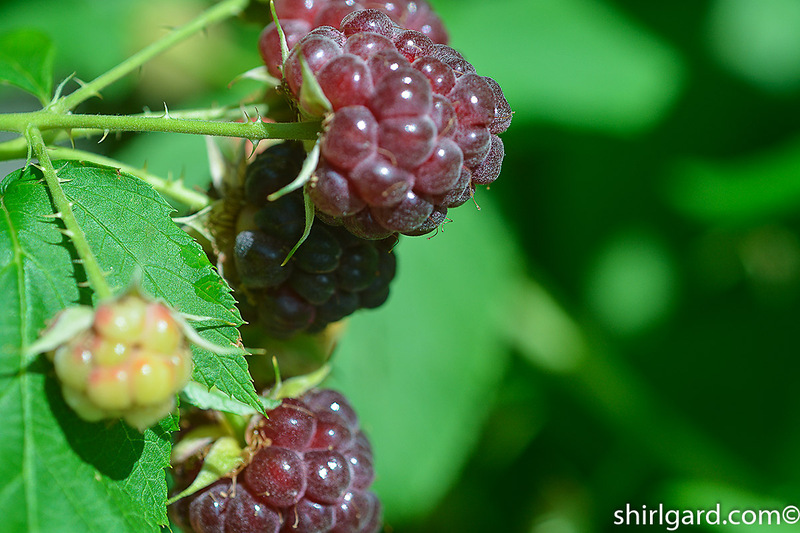 Although it is hot, sunny and buggy, the blackberries are sweet, juicy and delicious. Soon we all have purple lips. 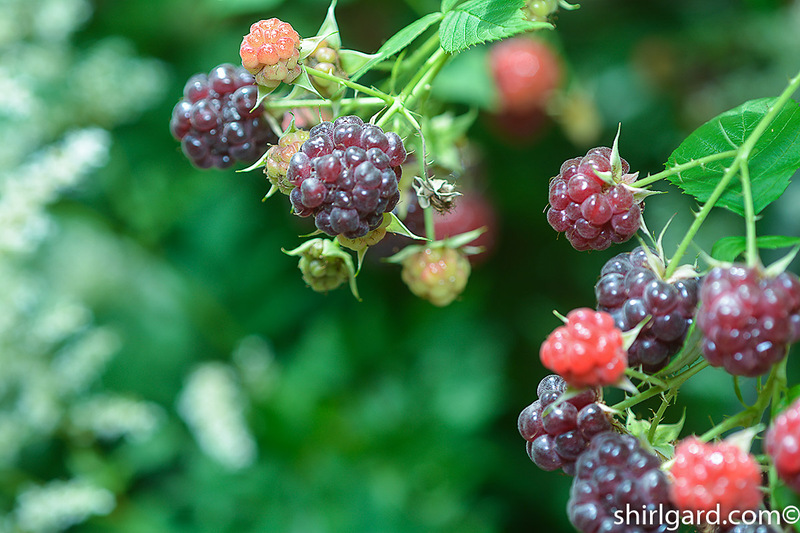 Wild Blackberries from my garden in Massachusetts. After a while, Mother looks at our buckets and says we have enough, so we head for home. 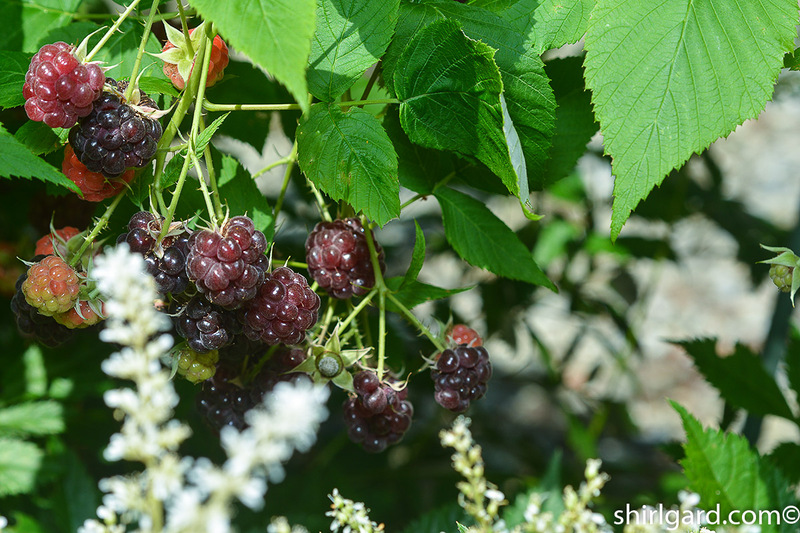 On the way home, which is just a few miles away, we spot more big ripe berries on the side of the road. Unfortunately, they are in the fence row across the ditch. Mother asks Danny to climb down into the ditch and up by the fence to pick a few more berries. It seems the ripest, biggest and most beautiful ones are always in the hardest-to-get-to places. Soon he comes back up the embankment to the car and we continue home with the usual assortment of scratches, ticks, and chiggers. We’ve have a lot of fun, but we all know that the best part is yet to come. Regrettably, Mother’s blackberry cobbler is just a memory, not a recipe, so I’ve had to improvise and make my own, remembering to do some things the way Mother would have, and adding a few of my own ideas. 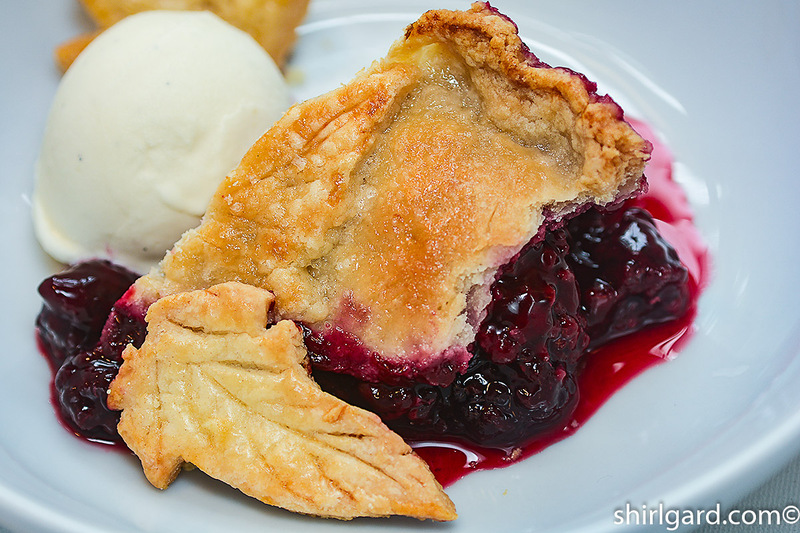 Take a big spoon and scoop up some juicy, purple Blackberry Cobbler. 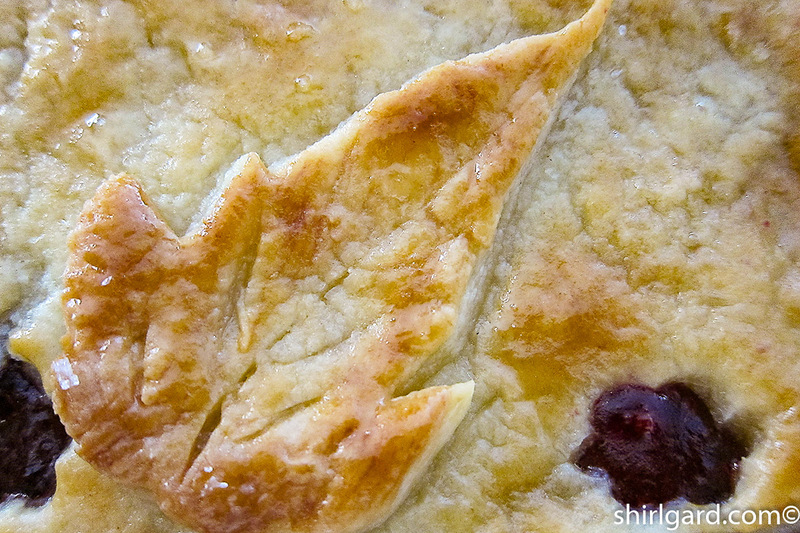 This one has a crust made using a tender Cream Cheese Pie & Cobbler Crust. Don’t forget to top it with a scoop of ice cream, or maybe a little whipped cream. 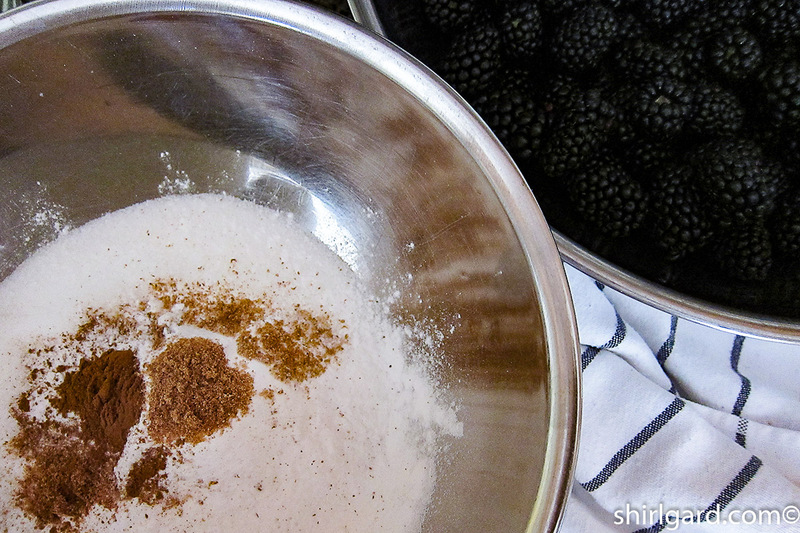 Mise en place for Blackberry Cobbler filling. It is an easy recipe to put together; just whisk together the dry ingredients, toss with berries, add liquids, and transfer to baking dish. It’s a NO COOK filling. Dry Ingredients: Sugar, Instant ClearJel, nutmeg, cinnamon, and salt. Blackberries from the supermarket. 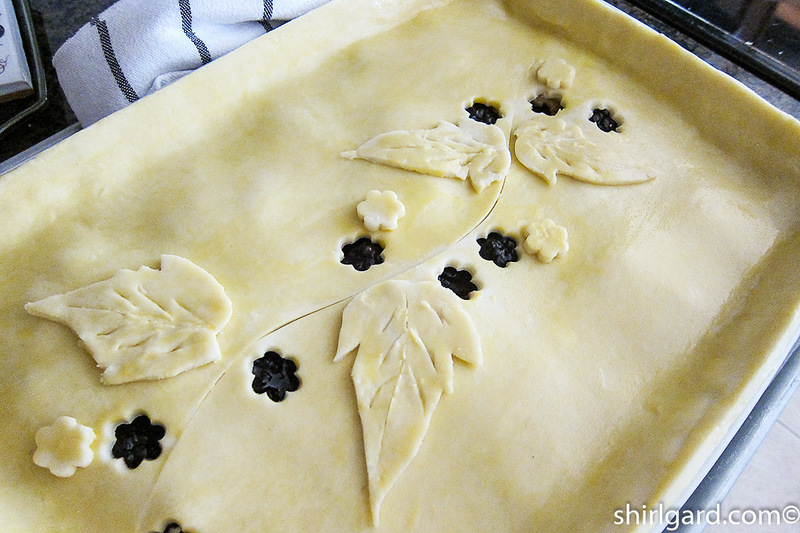 The filling in the casserole, dotted with thin butter slices, ready for the crust. 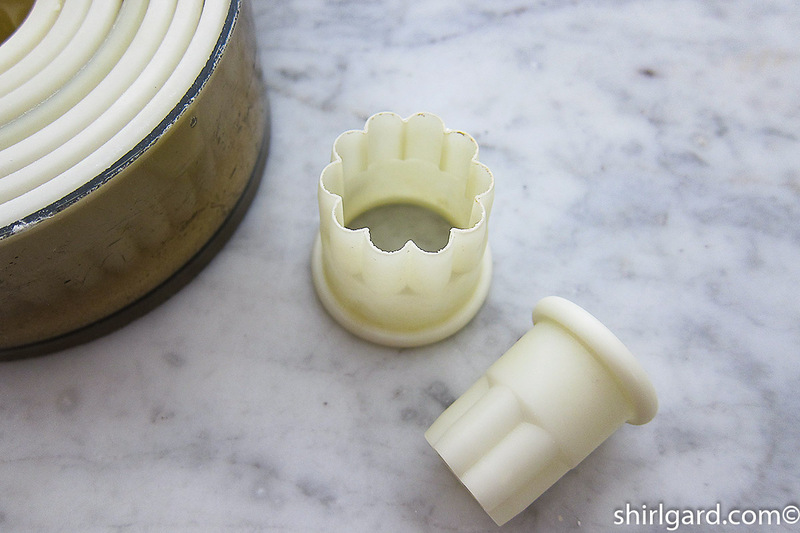 Cream Cheese Pie Dough, rolled 4 mm thick, which is between 1/8″ & 1/4″. See below how I decorated the top. I made this recipe in two different sizes of casseroles. 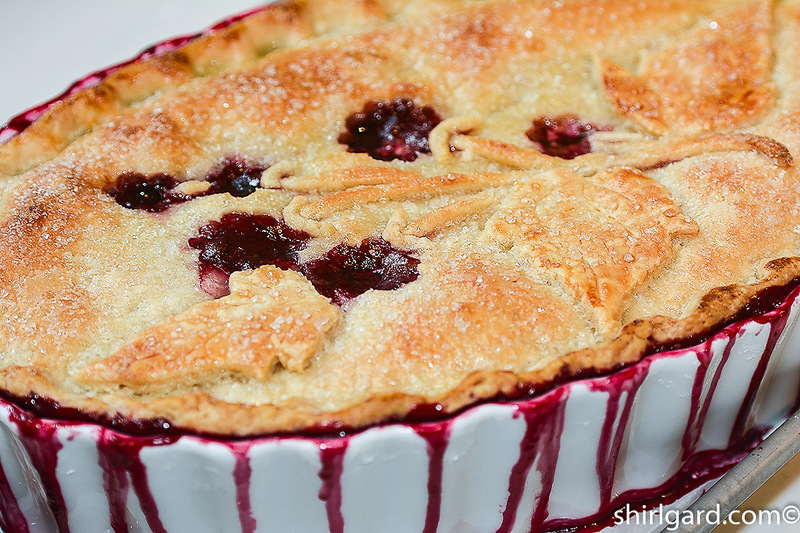 The first time I made it, in 2014, with wild berries from my garden, I used a 2-quart (2 lt) oval fluted dish, 7″ (17.5 cm) x 12″ (30 cm), which was almost too small for the recipe, but if you like the dripping-over-the-side-look, this is the size for you. Just be sure and put the casserole on a sheet pan, lined with parchment paper, to catch the drips. There’s something nostalgic about this cobbler for me, the drips reminding me of Mother’s. Recently, when I made this recipe, I used a 3-quart lasagna dish: 10″ (25 cm) x 14″ (35 cm). It was big enough so that the filling did not over-flow at all. If you want it neat and contained, use this size. A Pyrex 9″ (23 cm) x 13″ (33 cm) is also a 3-quart dish, if that’s what you have. Place your dish on a scale (tared to 0) as close to the sink as possible. Pour in a quart of water at a time, until it is completely full. The number of quarts that it holds = capacity. Be careful to tip the dish toward the sink when finished. A dish full of water is very unwieldy, and it is easy to pour the water all over the counter. I know, because I’ve done it. 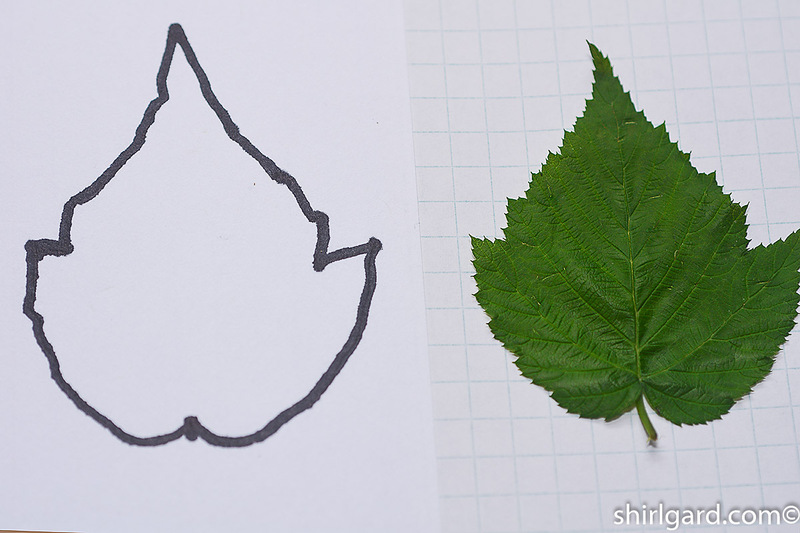 Pastry chefs, like me, actually do crazy things like this: pick some blackberry leaves, make templates, then use them to cut out dough leaves for the top of a cobbler. 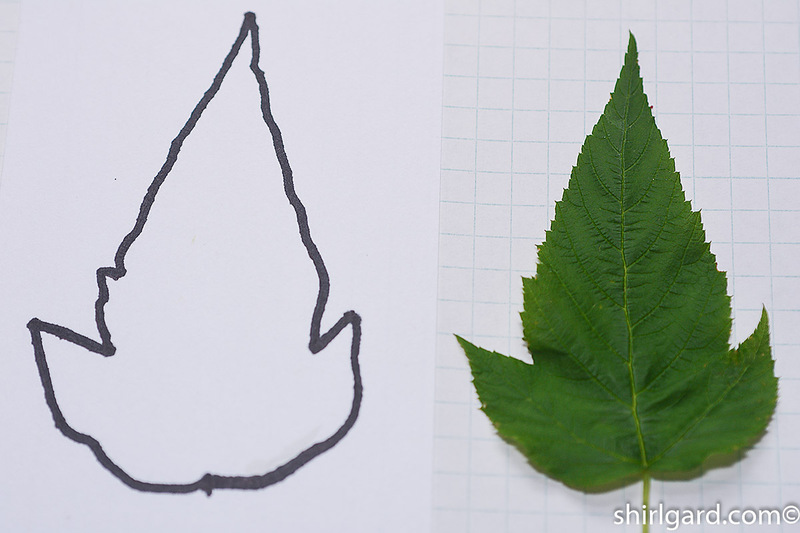 I made them from index cards, and laminated them on both sides, so the ink would not be next to the dough. 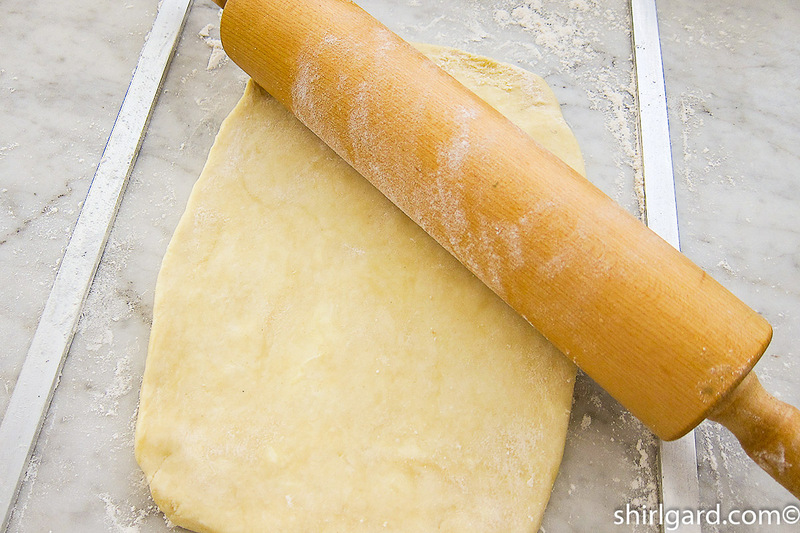 I rolled cold dough 4 mm thick (between 1/8″ & 1/4″). The size of the dough was 1″ (2.5 cm) bigger than my dish all the way around. I cut a long curvy “vine” down the center, then some random “berry” vents. At this point, I lifted the dough on top of the berries, cut it even with the top of the dish, egg washed it, and arranged my “leaves”. Ready to bake. 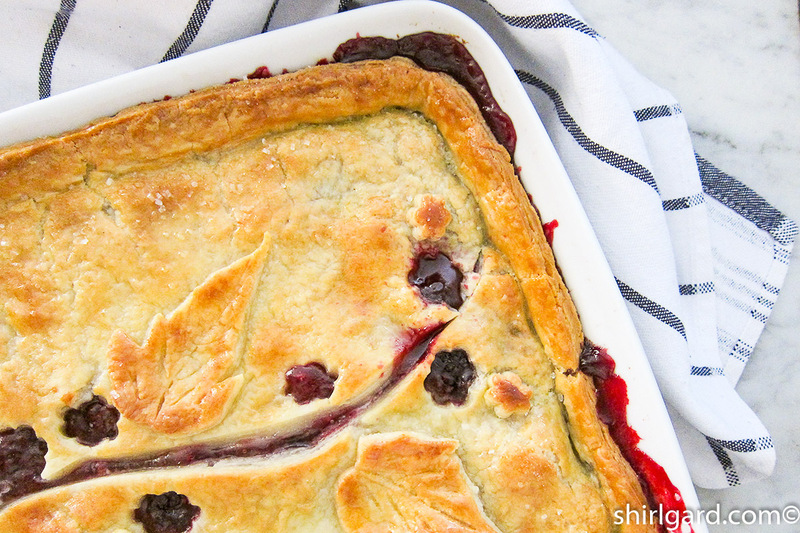 This Blackberry Cobbler looks so old-fashioned and home-y. It's a wonderful dessert, perfect for any summer holiday or other gathering. I developed the recipe through trial and error, by trying different thickeners, such as flour, cornstarch, tapioca starch, Instant ClearJel, and pectin. In the end, my favorite was Instant ClearJel, and that is what I have stayed with. If you don't know about this thickener, it's definitely worth searching out, even though you have to buy it on-line. Here's two places where you can find it: Amazon and King Arthur. 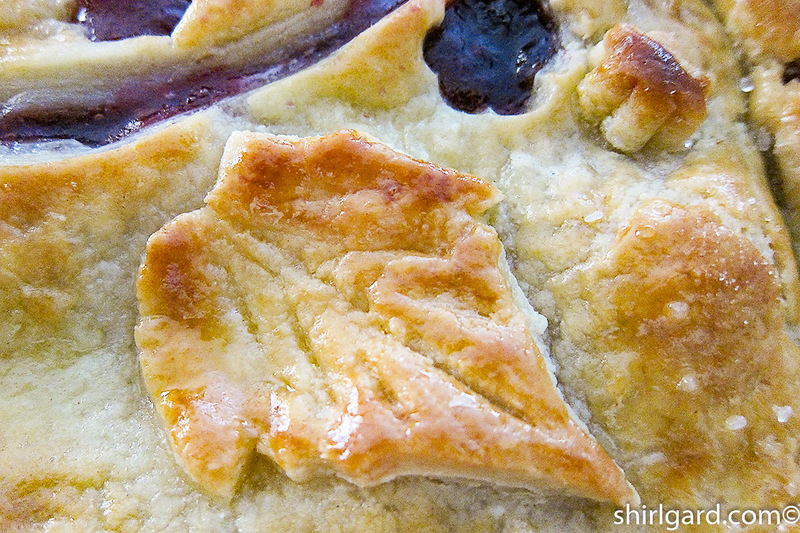 Instant ClearJel is a pre-cooked (called modified) cornstarch, which can be used baked or cooked (as in this cobbler), or unbaked (as in a fresh strawberry pie). 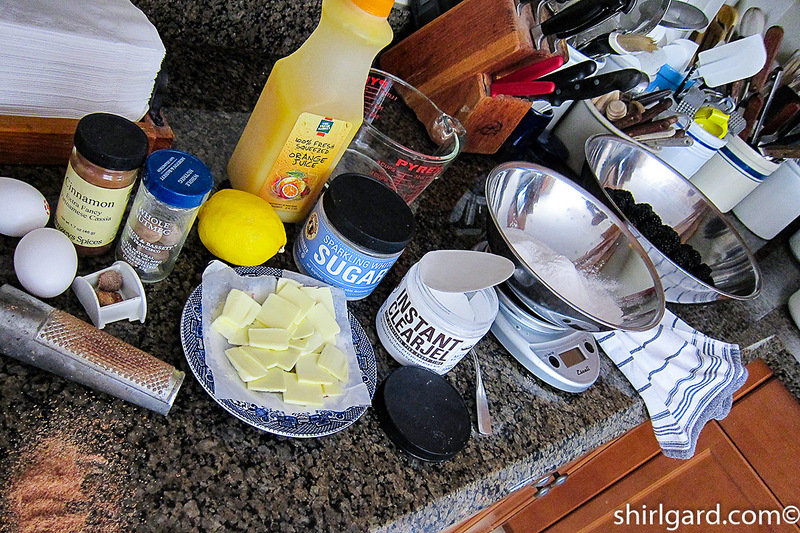 It should always be mixed with the sugar in a recipe, which prevents it from clumping when liquids are added. It bakes shiny and clear with no cloudiness. I love it for pies, cobblers, and crisps. 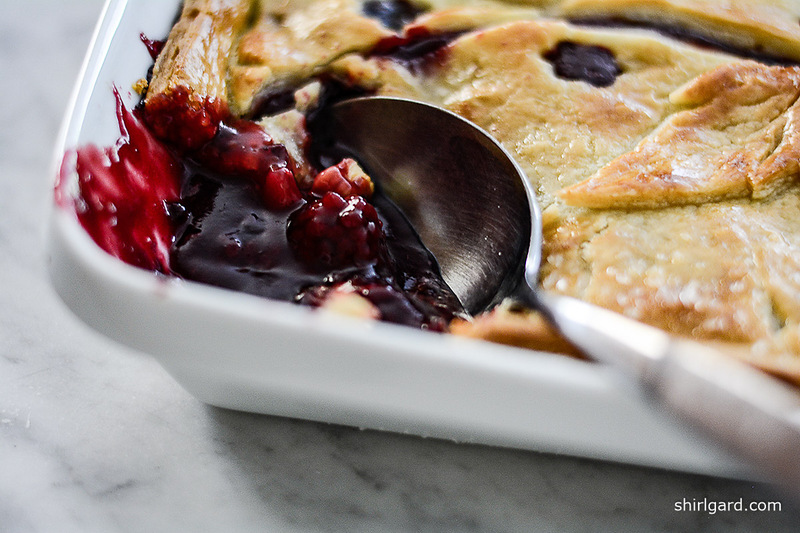 King Arthur has a very helpful chart on pie filling thickeners: Pie Thickener Ingredient Guide, which is worth printing out and keeping handy if you like to bake pies and cobblers. I recommend making the dough for the crust first, so it has time to chill because it"s important to work with cold dough. 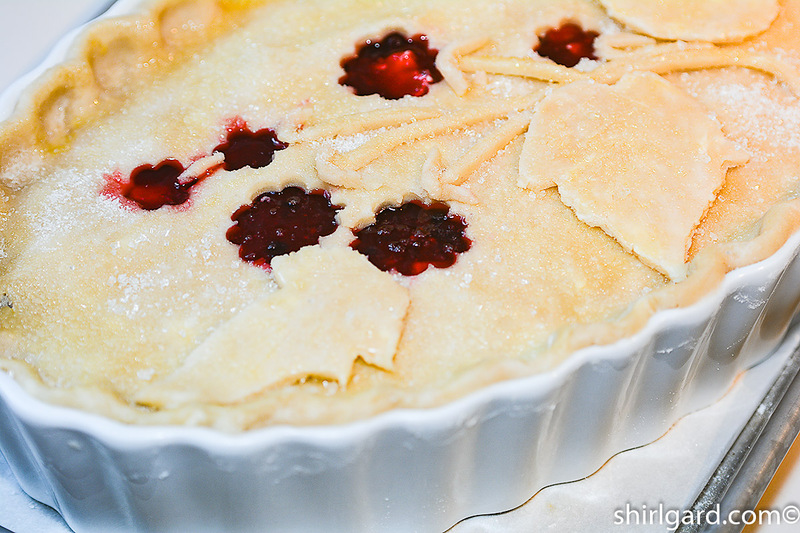 Here's the link: Cream Cheese Pie & Cobbler Crust. 645 grams Cream Cheese Pie & Cobbler Crust Link to separate recipe. (Use half a recipe). 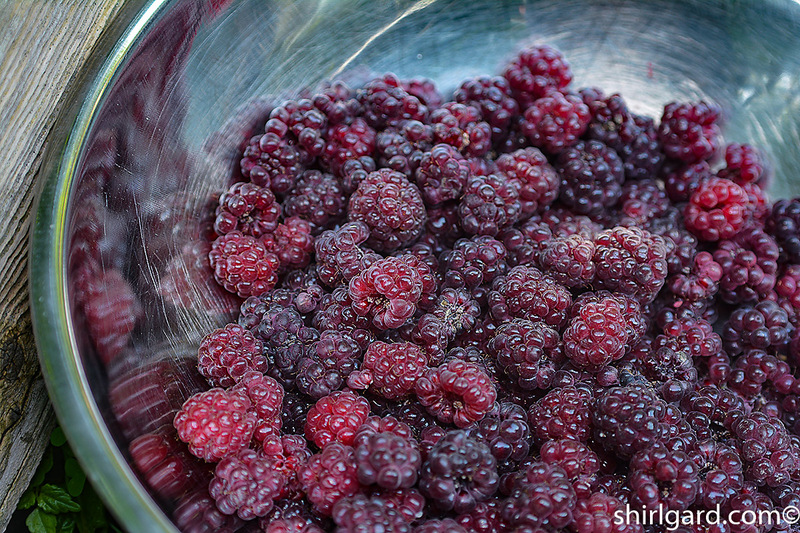 WASH and drain blackberries and place in large mixing bowl. Note: Weigh before washing. WHISK dry ingredients together and toss with berries. COMBINE liquids and pour over the berries. Stir gently to prevent crushing. TRANSFER filling to buttered 2½ - 3 quart (lt) casserole dish. (Or, spray the dish with Pam or other non-stick spray). 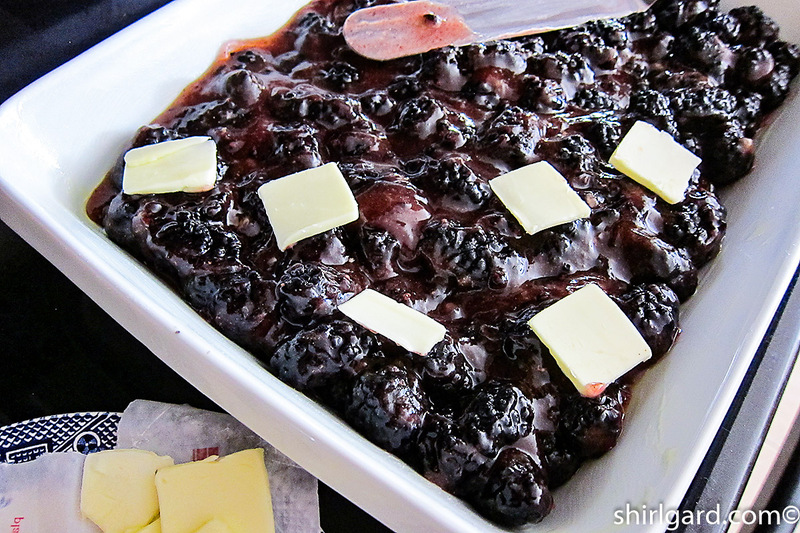 SCATTER the cold butter slices on top of blackberries. 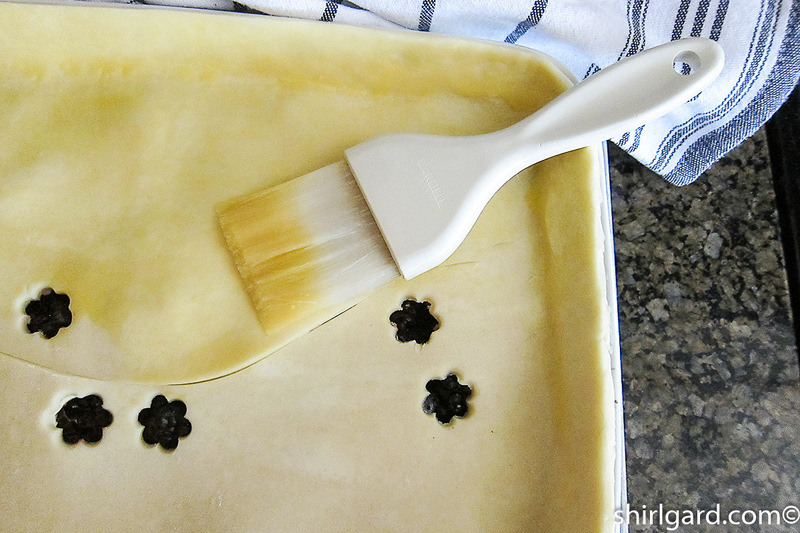 COVER with Cream Cheese Pie & Cobbler Crust (or other pie dough), rolled just a little thicker than ⅛" (4 mm). 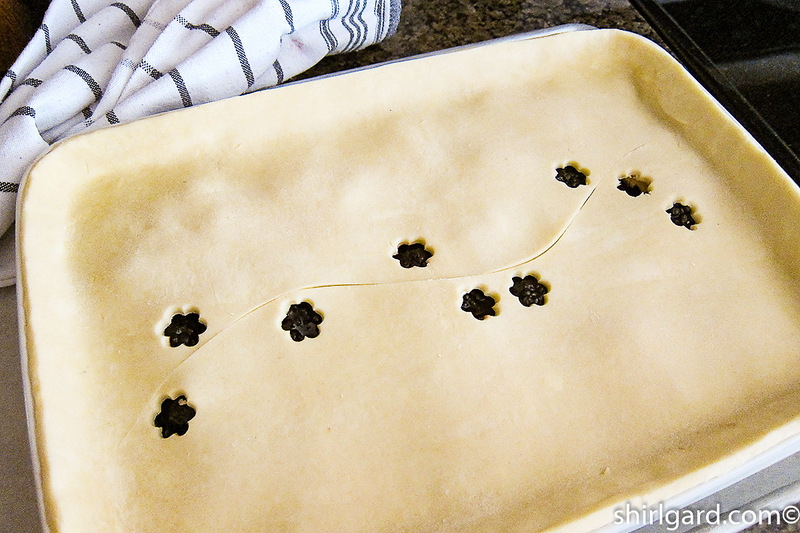 Crimp the edges or allow the dough to go up the sides of the dish to the top. Note: It will shrink down to the top of the berry filling and form a nice edge. 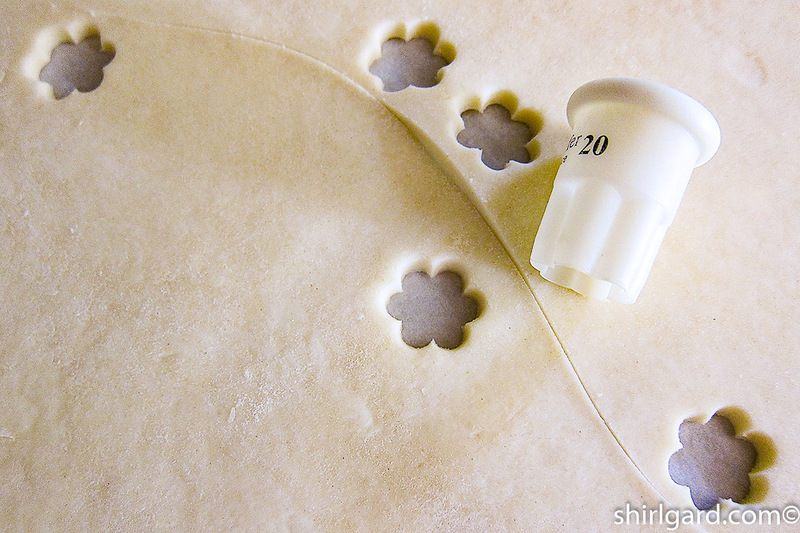 Cut steam vents in dough and decorate the top as desired. CHILL the cobbler until the dough feels firm, about 30 minutes. PRE-HEAT OVEN to 400° F (205° C) when ready to bake. 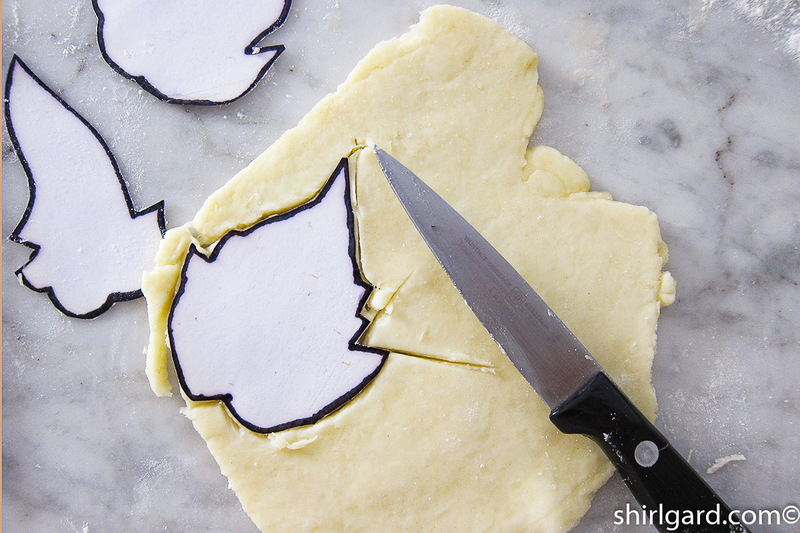 BRUSH with Egg Wash and add any dough cut-outs; egg wash the cut-outs. Sprinkle generously with granulated sugar or sparkling sugar (or a combination). BAKE at 400° F (205° C) for 30 minutes. Rotate casserole and turn oven down to 375° F (190° C) to finish baking, another 20-25 minutes. Total baking time = 50-55 minutes. 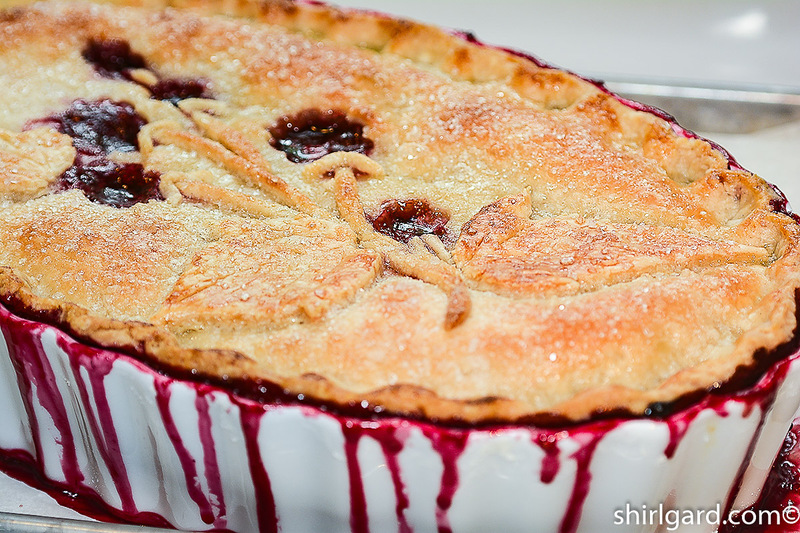 The cobbler is done when the top is a golden brown and the purple juices are bubbling. If, at any time, the crust is browning too much, cover loosely with a foil tent. 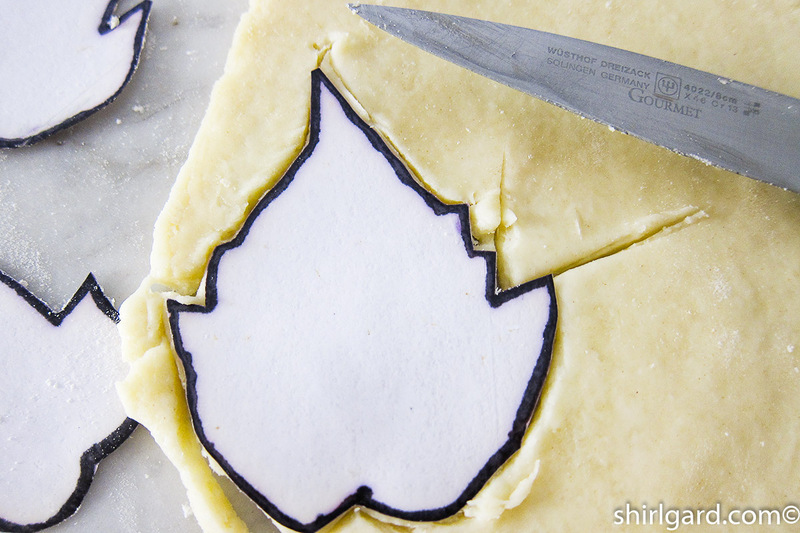 Never Miss a Recipe: Subscribe to ShirlGard Posts!